High School is over. Aislinn Munroe is ready to face the challenge of college and her new relationship. Aislinn has overcome her high school insecurities and embraced her relationship with reformed bad boy, Teagan Aldridge. Her life as a college student at the University of Florida is filled with new experiences and people, including the shining football star, Ryan Caldwell. Aislinn isn’t interested in Ryan’s attention or charm. She only wants to figure out what’s next for her and Teagan. Aislinn wants to take the next step in their relationship, but Teagan isn’t ready. Old insecurities sneak back in as Aislinn worries that their physical relationship has stalled. Teagan convinces Aislinn he just wants to wait for the right time, but his sweet gesture falls short when his ex-girlfriend Lauren shows up. Teagan’s past has finally caught up with him, and now they all have to face it. Every choice has a consequence, and Aislinn must make a decision. Teagan tries to take responsibility for his past, but Lauren only wants to monopolize his time and push Aislinn out of the picture. Aislinn has to choose. Trust Teagan and stand by her boyfriend, or let Lauren succeed in ripping them apart? College wasn’t supposed to be this hard. 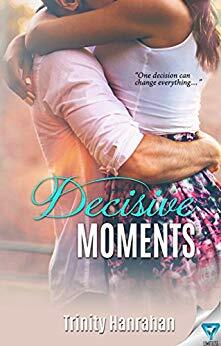 Some decisions have far-reaching effects, and this one could cost Aislinn her heart. It’s time to make up her mind and face her. $0.99 on Kindle.